KVERT reported that activity at Gorely decreased significantly in December 2013; volcanic tremor ceased being detected on 12 December, and the temperature of the thermal anomaly decreased during 12-15 December. No thermal anomaly was detected in January 2014, but weak seismicity continued along with gas-and-steam emissions. On 23 January the Aviation Color Code was lowered to Green (on a four-color scale). Our last Bulletin report summarized Kamchatka Volcanic Eruptions Response Team (KVERT) reports on eruptive activity at Gorely through 30 July 2010 (BGVN 35:07); MODVOLC was covered through 3 August 2010. In this report we note subsequent MODVOLC alerts for 10, 15, and 19 August 2010. KVERT reported that satellite-based thermal anomalies were detected on 10-12, 15, and 23 August 2010. During July and August 2011, reports noted red incandescence. This report covers activity through 6 July 2012. The Aviation Color Code remained at Yellow throughout the reporting period, indicating signs of elevated unrest above known background levels. Our sampling of available KVERT data revealed that for the remainder of 2010, seismicity was above background levels, with continued recording of volcanic tremor. Weak or moderate gas-and-steam activity of the volcano was observed periodically; clouds obscured the volcano on the other days. According to satellite data analysis, a thermal anomaly was registered over the volcano periodically for the remainder of 2010; on 12-14 and 18 November 2010. On 12 November, a gas-steam plume extended about 40 km NE. KVERT reported predominantly moderate seismicity, with continued recording of volcanic tremor through 2011. Periodic weak thermal anomaly over the volcano continued to be noted in satellite images. Moderate and strong gas-and-steam activity at the volcano was observed on 1-3, and 5 April. The lake in the active crater of the volcano disappeared (figure 7). Figure 7. Moderate-to-strong gas-and-steam activity at Gorely on 24 April 2011. Photo courtesy of A. Nuzhdaev. IVS FEB RAS. According to satellite data on 5 May 2011, a weak thermal anomaly was registered over the volcano, and a gas-and-steam plume extended about 15 km W. During 11-12 June, according to visual data, a red incandescence was observed in the new fumarole vent within the active crater, and the lake remained absent. During 7-8 July, the incandescence continued. Moderate fumarolic activity was observed on 20 July. On 26 July, observers noted a new lake within the active crater, including blocks of ice on the lake's surface (figure 8). The new fumarole was covered with colluvium, but red incandescence was seen within the vent. During 6-9 August these blocks of ice on the lake's surface were melting. Figure 8. Photo at Gorely on 9 August 2011 shows a new lake within the active crater. Courtesy, Yu. Nazimova. Moderate seismic activity continued during the remainder of 2011, along with volcanic tremor. According to satellite data, thermal anomalies were registered on 26 and 29 August; 4-5 September; 5, 11-12, 21-25, and 31 October; 1-2, 5, 13, 24, 27-28 November; 2, 7, 20 December. Strong and moderate gas-and-steam activity was observed during 22-23 and 29 December. A large thermal anomaly was detected during 29-30 December 2011. Seismic activity at Gorely increased in early January 2012 and continued to be elevated through February, but ceased being recorded after 5 February after a technical dysfunction. About 20-30 seismic events were registered within the volcanic edifice during 2-3 January. According to visual data, strong and moderate gas-and-steam activity was observed throughout January and February. Gas-and-steam activity became more moderate in March and continued at that level through the end of June. Thermal anomalies were registered by satellite images during 1-2, 6-8, 17, 23, 28, and 31 January; 2, 4-5, 7, 11, and 19-21 February; 24 March; 10, 15, 17, 24, and 28 April; 2, 3, 10, 11-13, 15, 22 and 30 May; 21 and 29 June. Visual observations on 12 May revealed that the bottom of the active volcanic crater was covered by snow, but strong fumarolic emissions persisted (figure 9). A gas-and-steam plume was seen rising to 4 km (a.s.l.) During 16-17 June. Figure 9. Bottom of active crater at Gorely on 12 May 2012, showing strong fumarolic emissions. Courtesy, D. Melnikov, IVS FED RAS. Between 28 June and 1 July 2012, seismicity was recorded at above background levels; continuous spasmodic tremor was detected on 28 and 30 June, and on 1 July 2012. Information Contacts: Kamchatka Volcanic Eruptions Response Team (KVERT), Far East Division, Russian Academy of Sciences, 9 Piip Blvd., Petropavlovsk-Kamchatsky, 683006, Russia (URL: http://www.kscnet.ru/ivs/); Sergey Senukov, Kamchatka Branch of the Geophysical Service of the Russian Academy of Sciences (KB GS RAS), Russia (URL: http://www.emsd.ru/); Alexander Ovsyannikov, Sergei Chirkov, and Anatolii Mushinsky, IV&S FED RAS; and Hawai'i Institute of Geophysics and Planetology (HIGP) Thermal Alerts System, School of Ocean and Earth Science and Technology (SOEST), Univ. of Hawai'i, 2525 Correa Rd, Honolulu, HI 96822, USA (URL: http://modis.higp.hawaii.edu/). KVERT reported that during 21-28 November seismic activity from Gorely was at moderate levels and volcanic tremor was detected. Satellite imagery showed a weak thermal anomaly over the volcano during 21-25 November. The Aviation Color Code level remained at Yellow. KVERT reported that during 12-19 November seismic activity from Gorely was above background levels and volcanic tremor continued to be detected. Gas-and-steam emissions were observed during 12-14 and 16-18 November. Clouds obscured the volcano on the other days. Satellite imagery showed a gas-and-steam plume drifting 40 km NE on 12 November and a weak thermal anomaly over the volcano during 12-14 and 18 November. The Aviation Color Code level remained at Yellow. KVERT reported that during 8-15 October seismic activity from Gorely was above background levels and volcanic tremor continued to be detected. A thermal anomaly on the volcano was seen in satellite imagery on 10 and 13 October. Gas-and-steam activity was noted during 10 and 13-15 October. The Aviation Color Code level remained at Yellow. KVERT reported that during 23-30 July seismic activity from Gorely was above background levels and volcanic tremor continued to be detected. A daily thermal anomaly on the volcano was seen in satellite imagery. Gas-and-steam activity was noted during 26-27 July. The Aviation Color Code level remained at Yellow. KVERT reported that during 16-23 July seismic activity from Gorely was above background levels and volcanic tremor continued to be detected. Gas-and-steam activity was noted daily and many new small fumarolic vents were seen in the active crater. The temperature of a daily thermal anomaly detected over the volcano in satellite imagery gradually increased from 29 to 46 degrees Celsius during 17-21 July. The Aviation Color Code level remained at Yellow. KVERT reported that during 9-16 July seismic activity from Gorely was above background levels, and gas-and-steam emissions rose from the crater most days. On 10 July, data suggested that the vent on the crater's inner NE wall, above the level of the lake, had grown by 2-3 times the original size. The lake level had also fallen. Analysis of satellite imagery showed a thermal anomaly over Gorely on 8, 10, 12, and 14 July, and gas-and-steam plumes that drifted 25-150 km SE, E, and S during 10 and 14-15 July. The Level of Aviation Color Code remained at Yellow. KVERT reported that during 24 June-2 July seismic activity from Gorely was above background levels, further increasing on 28 and 29 June. Analysis of satellite imagery showed a thermal anomaly over Gorely during 24-28 June; cloud cover prevented observations on other days. A gas-and-steam plume drifted 35 km S on 28 June. The Level of Aviation Color Code was raised to Yellow. KVERT reported that during 17-25 June seismic activity from Gorely was above background levels, and gas-and-steam plumes rose from the crater. A volcanologist working at Gorely on 17 June saw that a new vent had opened on the crater's inner NE wall, above the level of the lake. The vent opening was incandescent, and gas was emitted at temperatures of 800-900 degrees Celsius. Analysis of satellite imagery showed a thermal anomaly over Gorely during 17-18 and 21-23 June; cloud cover prevented observations on other days. The Level of Aviation Color Code was raised to Yellow. KVERT reported that during 6 and 12-13 June strong steam-and-gas activity from Gorely was noted, and during 11-18 June seismic activity was above background levels. A small increase in the size and temperature of a thermal anomaly over the volcano began on 15 June and was detected through 18 June. The Level of Aviation Color Code remained at Green. KVERT reported that seismic activity from Gorely increased during 10-27 March. The Level of Concern Color Code was raised to Yellow. KVERT reported that seismic activity in the area of Gorely and Mutnovsky volcanoes decreased during 15-18 June. Moderate fumarolic activity was observed on 17 June; no activity was noted or cloud cover obscured views the other days during 14-20 June. The level of Concern Color Code was lowered to Green on 20 June. KVERT reported that seismic activity in the area of Gorely and Mutnovsky volcanoes increased on 13 June. There is only one seismic station in the area of the two volcanoes, so the source of the seismicity could not be determined. Activity was not visually noted and satellite imagery was not available at the time of the seismicity increase. The level of Concern Color Code was raised to Yellow on 14 June. KVERT reported on 11 January that seismic activity in the area of Gorely and Mutnovsky volcanoes was slightly elevated above background levels during the previous three weeks, but increasing activity was not confirmed. There is only one seismic station in the area of the two volcanoes so the source of the seismicity cannot be determined. Activity was not observed on satellite imagery. The level of Concern Color Code was lowered to Green. KVERT reported that an increased level of volcanic activity has not occurred at Gorely recently, as news articles had indicated. The Concern Color Code at Gorely remained at Green. According to a Pravda news article, the Laboratory of Active Volcanism at the Institute of Volcanology reported that a seismic station located atop Gorely registered continuous tremor that was four times stronger than background tremor. In addition, "smoke" and steam rose 300 m above the volcano. Another report from the Kamchatkan Experimental-Methodical Seismological Department, which operates the seismic station, stated that the station is in the vicinity of both Gorely and Mutnovsky, therefore it is difficult to attribute the tremor to a specific volcano. They found that during 2-3 October a swarm of about 30 M 1.2-1.7 earthquakes was recorded, and on 26 October there were two M 1.7 earthquakes. During 1978-79 large fumaroles appeared in the central crater and a lake was formed on the crater floor. In January 1980 a 1-km-high gas column was first observed over the summit. This remained throughout the spring, and gas vents appeared on the walls and floor of the crater. In June intensive gas emission was accompanied by explosions that ejected lithic material. During this presumed phreatic eruption the crater lake disappeared. As of late July, activity was increasing and a glow was visible over the crater at night. Further References. Gavrilov, V.A., Gordeev, E.I., and others, 1984, Volcanic tremor and the Gorely volcano earthquakes during the 1980-1981 eruption: Volcanology and Seismology, no. 6, p. 3-17. 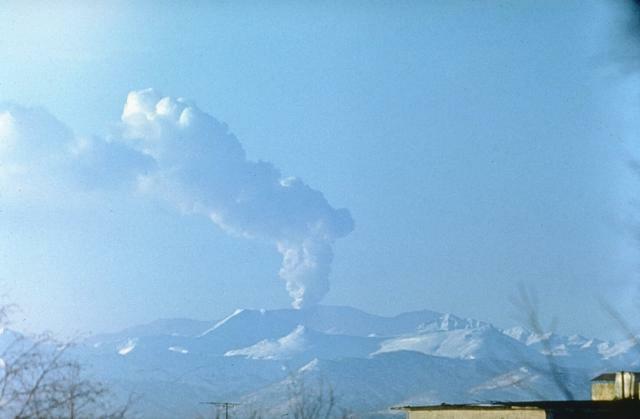 Kirsanov, I.T., 1981, Eruption of the Gorely volcano in summer 1980: Volcanology and Seismology, no. 1, p. 70-73. Information Contacts: E. Vakin and I. Kirsanov, IVP. Gorely began to erupt 27 December. During the initial activity, phreatic explosions ejected clouds that rose to 3.5 km height. Ash explosions began 30 December, producing plumes that reached 3 km height and extended 100 km E. The eruption ended 8 January. In the previous eruption, June 1980-July 1981, initial phreatic activity gave way in later phases to phreatomagmatic explosions that ejected alkali-rich basaltic andesite (Kirsanov and Ozerov, 1984). Reference. Kirsanov, I.T., and Ozerov, A.Yu., 1984, Composition of products and energy yield of the 1980-81 Gorelyi volcano eruption: Volcanology and Seismology, no. 5, p. 23-43. Further Reference. Gavrilov, and others, 1986, Intensification of Goreli volcanic activity in August-September 1984: Volcanology and Seismology, no. 5, p. 90-92. The eruption that began in late 1984 continued into 1986, when steam and ash emissions were observed in April. Reference. Budnikov, V.A., 1988, The eruption of Gorelyi volcano in April 1986: Volcanology and Seismology, no. 4, p. 99-103 (in Russian); v. 10, p. 650-658 (in English). On 19 September seismic activity increased and more than 20 earthquakes (M <= 1.8) were recorded beneath Gorely. However, no sign of eruptive activity was observed around the crater on 20 September. During 23-30 September seismicity returned to background levels. At 1832 on 22 October, a 10-minute series of shallow earthquakes was recorded at the volcano. The last Gorely eruptive activity occurred in 1980-81 (SEAN 05:07) and 1984-86 (SEAN 10:01). No volcanic activity was reported at Gorely from December 1999 through mid-October 2000. Seismicity, however, occasionally rose above background levels. On April 26, two small local events were recorded on seismic station GRL. On 22 July, two small volcano-tectonic earthquakes occurred between Gorely and neighboring Mutnovsky volcano. Seismicity returned to near-background levels until 24 September, when microseismic signals were registered on seismic station GRL. These signals continued to be recorded into early October. By 14 October, Gorely was quiet. Our last report about Gorely volcano in southern Kamchata (figure 1) described low seismicity in September 2000 (BGVN 25:09). The volcano generated at least seven eruptions in the 20th century, with the latest in August 1984. Below are available summaries of Gorely's activity from October 2000 to June 2010. The information came from various Russian sources credited below. During the first interval, between October 2000 and late October 2002, the volcano was generally quiet and mildly steaming with its lake occasionally boiling. Figure 1. A map showing Kamchatka and the location of Gorely. Activity during 23-29 October 2002. According to the Laboratory of Active Volcanism Institute of Volcanology and Seismology, IV&S, steam rose 300 m above Gorely's crater. During 2-3 October, about 30 earthquakes M ~ 1.2-1.7 were recorded, and on 26 October there were two M~ 1.7 earthquakes (information from Kamchatka Branch of the Geophysical Service of the Russian Academy of Sciences, KB GS RAS). There is only one seismic station ("Gorely") in the area of both Gorely and Mutnovsky, so it is difficult to determine the source of the seismicity and attribute the tremor to a specific volcano. Activity during 2007-2009. On 25 December, the Kamchatka Volcanic Eruption Response Team (KVERT) reported an increase in seismicity and undisclosed visual observations of activity. Seismicity had increased on 22 December and remained slightly elevated above background levels during 22-25 December. On 25 December, a gas-steam plume rose to an altitude of 2.2 km. Activity during June 2010. Volcanic tremor began to increase slightly on 6 June and strong steam-and-gas emissions were noted. Scientists reported a small plume that rose 400-500 m above the crater and areas of recently deposited ash on the S flank. Tremor increased gradually during the next few days. By 12 June, tremor had risen to several times background values (figure 2). During 12-13 June strong steam-and-gas activity was again noted. On 12 June a substantial steam plume was visible from Petropavlosk-Kamchatsky, ~ 80 km away. Figure 2. Seismicity recorded at Gorely station during 1 June through 31 July 2010. Volcanic tremor increased from 0.3 mm/s on 1 June to 2.15 mm/s on 1 July, and to 2.19 mm/s on 31 July 2010. Data from KB GS RAS. On 13 June, volcanologists observed continuous steaming to a height of ~ 300 m (Ovsyannikov and Chirkov, 2010). On 14 June, the plume rose about 1 km above the volcano (figure 3). Figure 3. Unusual gas-steam emission from Gorely seen at a distance on 19 June 2010. Photo by Sergei Chirkov. Observers watching the volcano from 15 to 22 June reported that a new bocca vent, about 20 m in diameter, had formed at the base of the NE wall of the active crater containing a thermal acid lake. The vent's lowest edge was only 5-7 m above the lake level. As the vent formed, chunks of rock and colluvial deposits fell into the growing cavity. The hot gas ejected under high pressure from the vent was seen as a flaming, glowing crimson color (figure 4) and was accompanied by a constant, low rumble. The gas temperature at the outlet, measured by an infrared instrument, was 870°C. Figure 4. (top) Bocca vent seen at the base of Gorely's crater on the NE wall. Newly formed small terraces on the shore of the opal-colored, acidic lake are clearly visible and are of uncertain origin. (bottom) Spectacular view of flaming gas seen at night reflected on the lake surface. Photos by Sergei Chirkov. Seismic activity remained above background levels during 24 June-2 July, with a further increase on 28-29 June. A gas-and-steam plume drifted 35 km S on 28 June. The formation of gas-and-steam clouds is dependent on atmospheric conditions; at some times a white column was visible above the vent. However, sometimes the column was gray due to ash (figure 5, right). The ash was interpreted as exclusively non-juvenile material resulting from the collapse of wall rock into the vent. Figure 5. Ash-bearing clouds emerging from the new vent at Gorely on 19 June 2010. Photo by Sergei Chirkov. Activity during July 2010. According to KVERT, seismic activity remained above background levels during 9-23 July 2010, and gas-and-steam emissions rose from the crater most days. On 10 July, data suggested that the vent on the crater's inner NE wall, above the level of the lake, had grown to 2-3 times the original size. The lake level had also fallen. Gas-and-steam plumes drifted 25-150 km SE, E, and S during 10 and 14-15 July. Many new fumarolic vents were observed in the active crater. The temperature of a daily thermal anomaly detected over the volcano in satellite imagery gradually increased from 29 to 46°C during 17-21 July. KVERT reported that during 23-30 July seismic activity from Gorely remained above background levels and volcanic tremor continued to be detected. On 26-27 July, gas-and-steam activity was noted. Formation of the vent had no visible impact on the acid thermal lake. However, in some unconsolidated lake-shore sediments, the scientists observed small terraces (figure 4). This indicates successive intermittent lowering of the lake surface. These shifts may be related to the increased seismicity under the volcano. Background. Observers saw a vent at the then-dry crater bottom during 1986 (figure 6, top). A vent on the NE crater's side was photographed in 1996; and can be compared with the latest vent observations (figure 6). Figure 6. (top) Vent developed in the crater bottom at Gorely in 1986. (center) The crater lake as seen in 1996. The broken line shows the margin of the present-day lake. (bottom) Bocca vent on the crater's NE side and lake after its formation on 21 June 2010. Top photo by Anatolii Mushinsky; center by Luda Eichelberger; bottom by Sergei Chirkov. During 2000 through 3 August 2010, the only thermal anomalies detected in MODIS/MODVOLC satellite imagery occurred during June-August 2010 (16 June, 21 June, 11 July, 20 July, 27 July, and 3 August). References. Gavrilenko, G., Melnikov, D., Ovsyannikov, A., 2008, Current state the thermal Lake into active crater Gorely (Kamchatka): Materials of Russian Scientific Conference "100 years of the Kamchatka expedition of the Russian Geographical Society 1908-1910." (Petropavlovsk-Kamchatsky, 22-27 Sept. 2008) (In Russian), Petropavlovsk-Kamchatsky, 2009, 267 p.
Leonov, V., 2006, Influence of depth breakthrough zone on the structure of volcano (the case of Gorely, Kamchatka): Volcanism and Geodynamics. Proceedings of III All-Russia Symposium on Volcanology and paleovolcanology, 5-8 September 2006, Ulan-Ude, 2006, p. 461-467. Melekestsev, I.V., Braitseva, O.A., Ponomareva, V.V., 1987, Holocene activity dynamics of Mutnovskii and Gorelyi volcanoes and the volcanic risk for adjacent areas (as indicated by tephrochronological studies): Volc Seism, 1987, vol. 3, p. 3-18 (English translation 1990, vol. 9, p. 337-362). Ovsyannikov, A. and Chirkov S., 2010, Activity (status) of Gorely volcano, June 2010: Bulletin of Kamchatka Regional Association (Educational-Scientific Center); Earth Sciences (in Russian), IV&S FEB RAS, Petropavlovsk-Kamchatsky, 2010, vol. 1, no. 15, ISSN 1816-5532 (Online). Information Contacts: Kamchatka Volcanic Eruptions Response Team (KVERT), Far East Division, Russian Academy of Sciences, 9 Piip Blvd., Petropavlovsk-Kamchatsky, 683006, Russia (URL: http://www.kscnet.ru/ivs/); Kamchatka Branch of the Geophysical Service of the Russian Academy of Sciences (KB GS RAS), Sergey Senukov, Russia (URL: http://www.emsd.ru/); Alexander Ovsyannikov, Sergei Chirkov, and Anatolii Mushinsky, IV&S FED RAS; Hawai'i Institute of Geophysics and Planetology (HIGP) Thermal Alerts System, School of Ocean and Earth Science and Technology (SOEST), Univ. of Hawai'i, 2525 Correa Rd, Honolulu, HI 96822, USA (URL: http://modis.higp.hawaii.edu/). Gorely volcano consists of five small overlapping stratovolcanoes constructed along a WNW-ESE line within a large 9 x 13.5 km caldera. The caldera formed about 38,000-40,000 years ago accompanied by the eruption of about 100 km3 of tephra. The massive complex includes 11 summit and 30 flank craters, some of which contain acid or freshwater crater lakes; three major rift zones cut the complex. Another Holocene stratovolcano is located on the SW flank. Activity during the Holocene was characterized by frequent mild-to-moderate explosive eruptions along with a half dozen episodes of major lava extrusion. Early Holocene explosive activity, along with lava flows filled in much of the caldera. Quiescent periods became longer between 6000 and 2000 years ago, after which the activity was mainly explosive. About 600-650 years ago intermittent strong explosions and lava flow effusion accompanied frequent mild eruptions. Historical eruptions have consisted of moderate Vulcanian and phreatic explosions. Egorov Y O, Gavrilenko G M, Osipenko A B, Weidmann Y, Adank M, Perre C, Sergeeva S V, 1999. 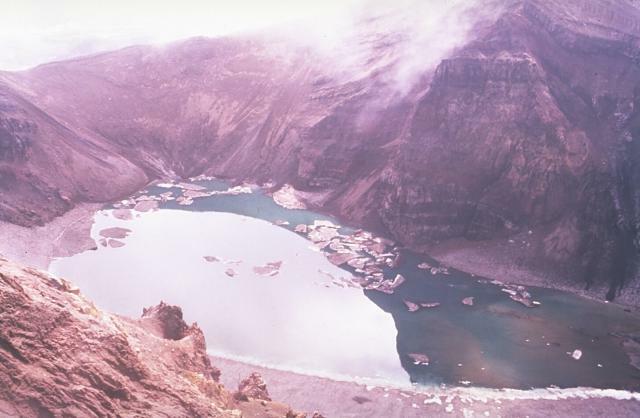 State of the acid crater lake of Gorelyi volcano, Kamchatka, in the summer of 1996. Volc Seism, 20: 713-719 (English translation). Melekestsev I V, Braitseva O A, Ponomareva V V, 1987. Holocene activity dynamics of Mutnovskii and Gorelyi volcanoes and the volcanic risk for adjacent areas (as indicated by tephrochronological studies). Volc Seism, 1987(3): 3-18 (English translation 1990, 9: 337-362). Selyangin O B, Ponomareva V V, 1999. Gorelovsky volcanic center, South Kamchatka: structure and evolution. Volc Seism, 21: 163-194 (English translation). There is data available for 53 Holocene eruptive periods. There is no Deformation History data available for Gorely. There is no Emissions History data available for Gorely. 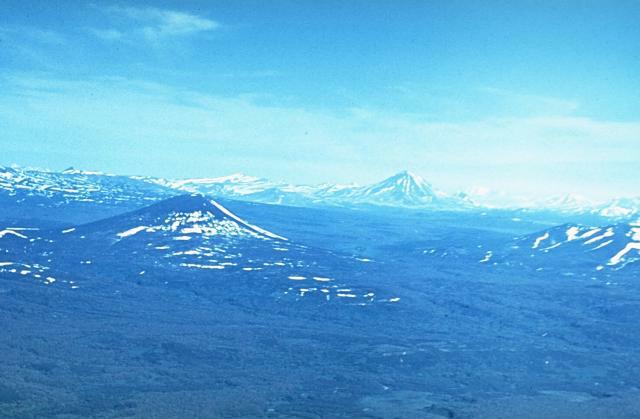 The small basaltic Visokiy stratovolcano (left center) is surrounded by young lava flows produced by regional basaltic volcanism. 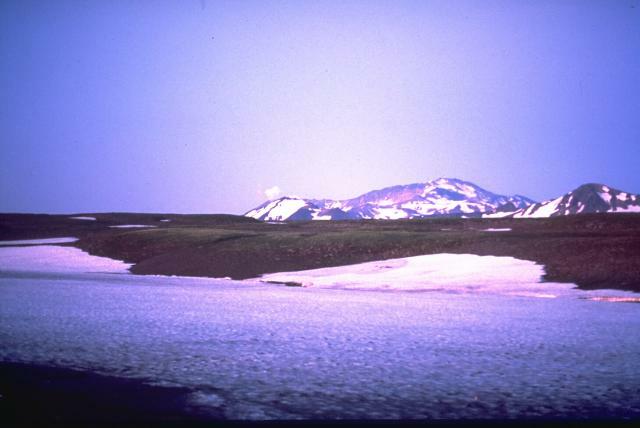 The 1234-m-high Visokiy is seen here from the SW with snow-capped Gorely volcano on the distant skyline above and to its right and sharp-topped Mutnovsky volcano on the right-center horizon. In contrast to the large active stratovolcanoes of Gorely and Mutnovsky, no historical eruptions are known from Visokiy volcano. Photo by Andrei Tsvetkov, 1977. An ash-poor eruption column, seen here in a telephoto view from the north, rises above Gorely volcano in February 1985. Intermittent minor ash eruptions began from Gorely in August 1984 and lasted until September 1986. Steam-gas columns sometimes lightly loaded with ash reached 2-km heights. The eruption deposited fresh ash on the slopes of the volcano and the crater lake was strongly agitated. 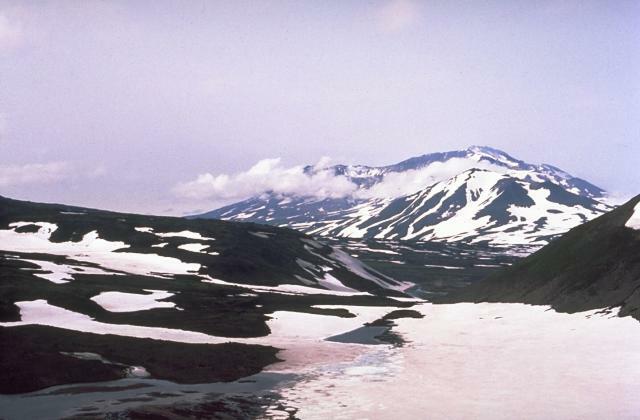 Gorely volcano, one of the most active in southern Kamchatka, consists of five small overlapping stratovolcanoes that were constructed within a large Pleistocene caldera. The 9 x 13.5 km caldera, whose rims in this view from the south form the flat area on the center horizon and the peak at the right, was created about 40,000-50,000 years ago. The massive Gorely complex contains 11 summit and 30 flank craters. Historical eruptions have consisted of vulcanian and phreatic explosions of moderate volume. Photo by Phil Austin, University of Southern Florida, 1992 (courtesy of Pavel Kepezhinskas). Part of the summit complex of Gorely volcano is seen in this view from the south. Gorely, also known as Gorely Khrebit, is one of the most active volcanoes in southern Kamchatka. Five small overlapping stratovolcanoes, constructed within a large caldera, contain 11 summit and 30 flank craters. Historical eruptions, consisting of vulcanian and phreatic explosions of moderate volume, have commonly produced ash columns that are visible from Petropavlovsk, Kamchatka's largest city. The central of three large craters cutting the summit of the elongated Gorely volcano contains a lake. Stratified ash-flow deposits are exposed in the walls of the crater, which is drained to the SW (lower right) through a small gorge. Small icebergs float on the surface of the lake in this July 1992 view. 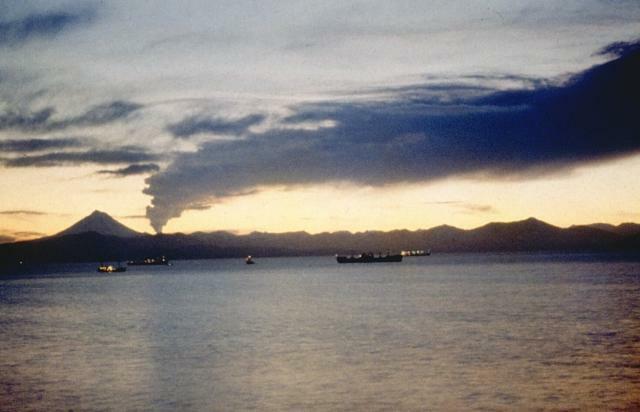 An eruption plume from Gorely volcano drifts to the north across Avachinsky Bay in this 1980 view from Petropavlovsk, Kamchatka's largest city. Explosive activity began in June 1980, and intermittent explosions took place until July 1981. A strong eruption on July 31 produced an eruption plume that rose up to 5.5-km altitude, and a pyroclastic flow took place on December 3, 1980. The sharp-topped peak to the left of the eruption plume is Vilyuchik volcano. Photo by Kamchatka Volcanic Eruptions Response Team, 1980 (courtesy of Dan Miller, U.S. Geological Survey). Large Eruptions of Gorely Information about large Quaternary eruptions (VEI >= 4) is cataloged in the Large Magnitude Explosive Volcanic Eruptions (LaMEVE) database of the Volcano Global Risk Identification and Analysis Project (VOGRIPA).